The Timbers provides a panoramic view of the tranquil Spring Valley. Horses grazing in the beautiful valley provide the perfect setting for an eveningout on the 800 square foot deck or sitting by the Timbers’ fire pit roasting marshmallows visiting with family and friends. The Timbers can seat up to 225 people comfortably for ministry events, wedding receptions, family reunions or special dinner events. The Timbers has a sleeping area, with its own full bathroom and can sleep up to 30 people. The Timbers 2,000 square foot Great Room features open beams, grand fireplace, beautiful furnishings, large flat screen TV, audio/visual equipment, stage if needed, Ping Pong table and board/card games. Complimenting the 2,000 square foot Timbers Great Room is a spacious seating area/conference room that also opens to the deck. The Timbers creates a wonderful atmosphere for ministry retreats, staff conferences or quality time with family and friends. This space is perfect for long conversations with family and friends about yesteryear and for making lasting memories for years to come. Naps are also welcomed. The River House at Bird Hollow is a beautiful and spacious property with 2 living areas, 3 bedrooms, a large kitchen and 2 full baths. Booking a stay at the River House provides access to a world class sporting clay course and 5 Stand Shooting venue only a mile from the home. Boat, canoe and kayak rental is available at the property. Tile floors, luxurious knotty pine paneling and panoramic windows provide breathtaking views of Grand River and the Oklahoma sunsets. The upstairs and downstairs living spaces have cable and flat screen TV's. Each bathroom has a large walk-in shower. 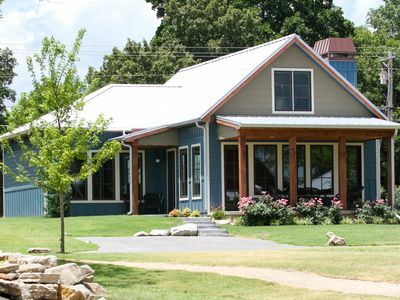 The River House is perfect for large groups to get together and celebrate the occasion. Grand River rolls by the house only 50' away, with the boat launch to Grand River less than 100' from the house. "Still Waters" on Lake Hudson. Fish and swim off the dock! Family Reunions, Weddings, Large Groups, We've Got You Covered. On Lake Hudson. 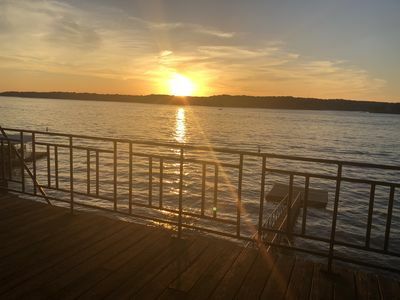 Nestled on the shore of beautiful Lake Hudson, one of the top 100 fishing lakes (64th) in the U.S. as rated by Bassmaster, Leave all the stress behind and relax at our quiet, peaceful resort, Enjoy our beautiful two-story home overlooking Lake Hudson and gardens. Horseshoe INN is a 5 bedroom, 3 bathroom updated home with a large open kitchen and living area. The upstairs great room has 2 queen beds, Dish TV and a balcony looking out over the lake and 5 acre property. There is a large bathroom with walk-in shower, jetted tub for two and double vanities. A pocket door opens up to another bedroom with a full bed, twin bed and snack area. Downstairs, the master has a king bed with on suite bathroom. Fourth and firth bedrooms both have queen beds and share the third bathroom, which has a walk-in shower. The living area has two queen size sleeper sofas as well as other comfortable chairs and recliners. Fully equipped kitchen with enough pots and pans to feed a crowd. There are plenty of dishes for inside and lots of plastic trays and glasses for outside entertaining. Dining table for eight, kitchen table seats six and the bar accommodates three. There is a wrap around deck. The sun deck overlooks the pool and the shade deck overlooks the lake. Tables and chairs and lounge chairs are provided for your comfort. 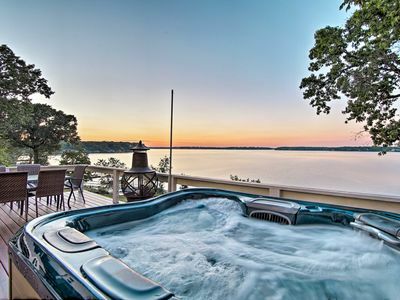 You can also access the four person hot tub from the deck. The shaded deck has a misting system to keep you cool while you enjoy the fresh, country air. Relax as you listen to the water cascading over the rocks in the Koi Pond. Beautiful grounds to explore and enjoy our landscaping. Volleyball, croquet, kayaking, horseshoe pitching and bird watching are just a few of the ways to spend your time on the property. 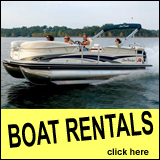 Great fishing off the dock or rent our pontoon for a day on the lake. Fishing, sight seeing around the 12,000 acre lake or tubing are great ways to enjoy the water. Need more room? 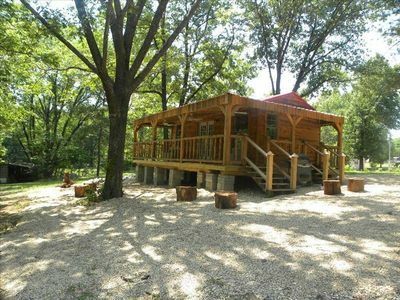 We have a bunk house with two additional bathrooms, kitchen, TV and air conditioning. It is set up with table and chairs for dining or playing games. RV sites, cabins and camping area available for the rest of your friends or family who would like to join you. Washer and dryer provided. Large storm shelter in basement of the INN. 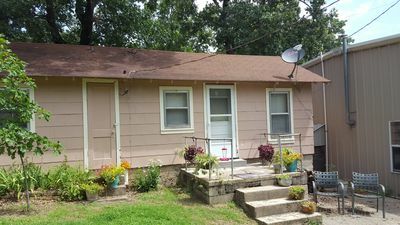 Completely renovated 2 bedroom, 1 bath home. Open living plan includes kitchen with bar seating and new appliances, including electric stove, microwave and dishwasher. Living area includes 50 inch flat screen TV. Each bedroom has King size bed and includes a 32 inch flat screen TV in each bedroom . The bathroom includes a tub and shower and large vanity. The house has Central heat and air conditioning. There is plenty of parking for off road vehicles. The property is centrally located in Langley. 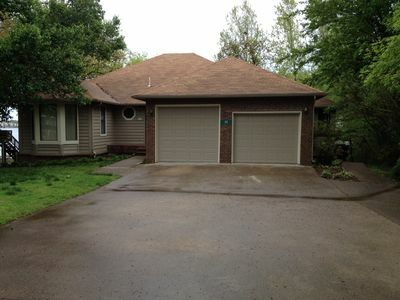 Located near Cherokee Golf course and close to boat ramps for Grand Lake and Grand River. Just minutes from off road vehicle rock climbing in Disney. We are within 1 mile of Reasor's grocery and Speedy's convenience store and Pier 13 liquor store, as well as many dining options. Bring your boat, jet skis, ATV's, RV's or Jeeps and make memories at this great South Grand Lake location. 1560 SF on south Grand Lake with plenty of parking for all your toys. 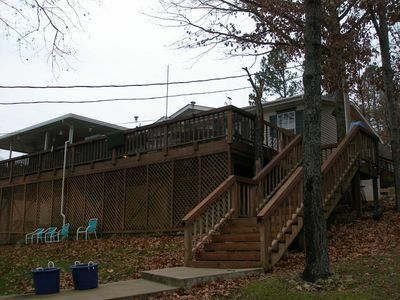 Three bedroom, three full baths with dock. Dock your boat, fish or swim right from your own dock. 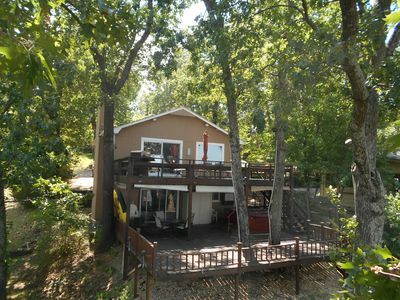 The property has a large deck overlooking the lake for entertaining your friends and family. 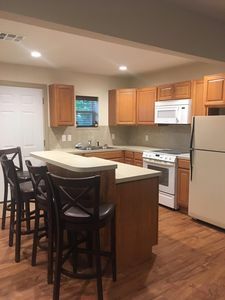 The kitchen is equipped with refrigerator, range/oven, microwave, coffee maker, washer and dryer, linens, towels, dishes and utensils, just bring your own food. This property has three RV hook ups with an outside shower house for your friends that own RV's. The RV hook ups are only water and electric with no sewage disposal. Drive your ATV's or jeeps to the famous Disney off-road recreational park or jump on your boat and head out to enjoy everything Grand Lake has to offer straight from this location. No pets of any kind please. Please note that the dock is for the renters use however the covered area with lift is set up for a specific boat and is not available to use due to liability reasons. The renter can tie their boat up to the outside of the dock. The RV hook ups are an additional one time charge of $75.00 per RV. 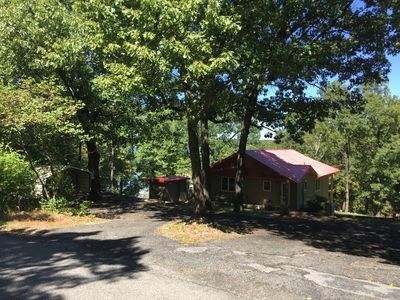 Fully renovated lakefront cabin on Morrow Point next to Morrow's Bar and Grill! This cabin is a full modern renovation but still has the original wood to keep the old cabin charm. It has 1 bedroom and 1 full bath with a living area and full kitchen. 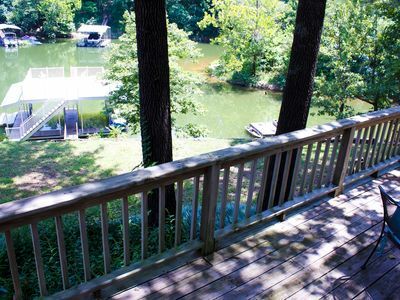 There is a brand new deck overlooking the lake and shaded by trees. There is a brand new gas grill on the deck. The one bedroom comfortably sleeps two, and the couch in the living area could sleep a third. There is also enough floor space for an air mattress for a fourth. AWESOME night's sleep. S Grand Lake. East of Disney 1 mile. Quiet location. Quiet point on south Grand Lake 1 mile east of Disney with partial lake view from the outside of the cabin. $75 a night, $305 weekly, $616 a month. Pets OK. Beautiful main Lake view as you walk around the shady road on Hind's Point. Not waterfront. NO ACCESS to lake from the cabin. NO INTERNET. Public boat ramp 1 mile away, public swimming one mile away at Cherokee State Park. Studio cabin with an AWESOME queen bed and futon with a 10 inch mattress that makes a restful full bed. Lots of pillows. Awesome for two, cozy for four. Linens, towels, pots & pans, crock pots, coffee pot, blender, large toaster oven, hot plate, dishes, iron, ironing board. Bathroom/shower, shower soap, shampoo/conditioner and hair dryer. Antenna TV with 40 + channels. Air/Heat. Pets ok. Located 1 mile east of Disney. Lots of parking. Paved roads. Take a step back in time in a vintage cabin on the lake that has been updated but has the charm of the past. 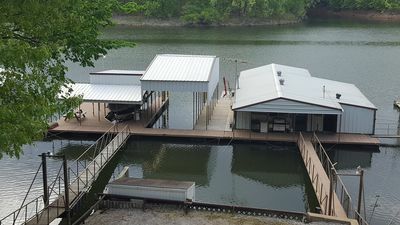 Close to restaurants, shopping, hiking, boating, ATV rock crawling, rentals at the marinas, fishing, rock climbing, bird watching, relax and enjoy the pace and beauty of Grand Lake of the Cherokees. 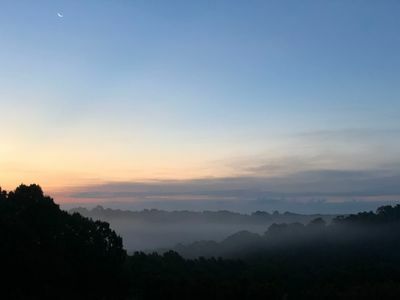 Then come home to your cabin for rest and relaxation, take a walk around the shady point, see the beautiful sunset and get a Great night's sleep! (The queen bed is AWESOME!) The location is quiet. Owners live on site. 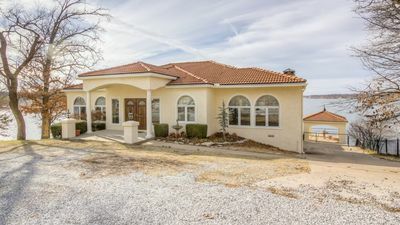 Large Family Home on Grand Lake Perfect for a quiet family getaway or a gathering of two or three families for a family reunion. Five bedrooms allow room for everyone with one master bedroom and full bath upstairs, two bedrooms on main floor with full bath and two bedrooms downstairs for the kids or more guest. Three floors with lots of room to spread out and do your own thing. Flat screen televisions on all floors, cable, VCR, DVD and internet included. Two large decks overlook the lake and swimming area below. One dock on the property perfect for safe swimming, located inside 5 mile an hour buoy zone. 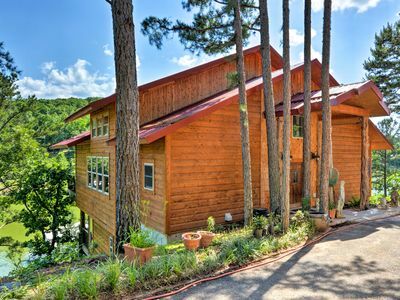 This property is on one of the prettiest locations on Grand Lake. Get Away and Relax in TiaJuana on Grand Lake! Newly renovated one bedroom one bath with separate loft bedroom. Bedroom has queen bed and hide-a- bed loveseat, and loft has 2 queen size beds. Plenty of room with great views and lake access. Day dock available for swimming, fishing, or simply relaxing. This property has everything you need for a quiet get-a-way from a hectic life. Kitchen is equipped with range and microwave and has a separate laundry area. Take time away to rest and refresh. This unit sleeps 7 with plenty of storage and parking. Wi-fi available. No pets allowed. Disney Home on Grand Lake w/ Fishing Dock! Beautiful Tuscan home on South Grand Lake. 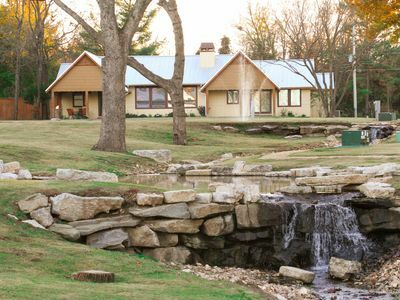 Just a short drive from Tulsa or Joplin for a relaxing retreat. Amazing sunset views from upper and lower decks that span the length of the home. This home has 4 bedrooms and sleeps 8 adults as well as additional guests on sofas in living areas. Fully stocked kitchen is stunning with granite counter tops and everything you need to cook for 2 or 10. Washer and dryer in unit as well as gas grill. Master bedroom has a King size bed and located on main level of home along with another bedroom with a queen size bed with en suite bathroom. On the lower level there are 2 additional bedrooms, both with queen size beds, as well as a 2nd living area and regulation slate pool table. Home boasts over 3700 square feet of living space. Enjoy your fall and winter on the lake watching eagles in flight, pelicans bobbing in the water, and the best Christmas Boat Parade in the four state area! 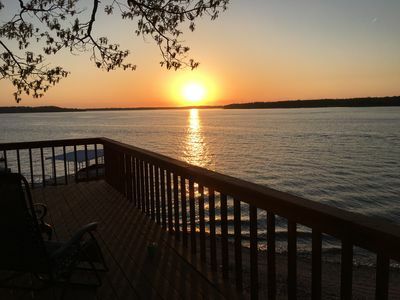 Come back to relax on the awesome decks watching the best sunsets on Grand Lake. 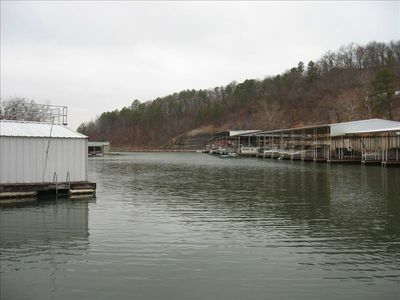 2 slip boat dock is available for use during rental. Home is located on the main lake at the mouth of Rapier Hollow close to lakeside restaurants and a marina for boat launching. Privately Owned by myself. 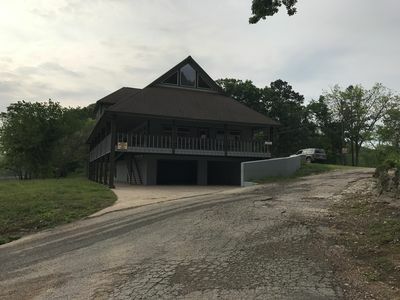 The Grand lake property is a water front property that sets on a bluff overlooking beautiful Grand Lake with a swim dock that sets below the house. 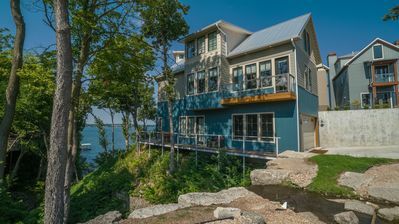 Grand Lake Waterfront house sleeps 4-6 people. Kitchen dining and family room overlooks a beautiful view of Grandlake. The kitchen bar is made of a 1950 wooden cruiser boat. (See photos). The Key west Townhome is a 3 bedroom with 2 living rooms with sleeper sofas. Key west house sleeps 6 Very comfortable and eight adults easily. MILLION $ Sunset Views on Waterfront with Shared Private Dock and Boat Slip! Welcome to Mi Casa Blanca Homes where you can relax and escape from it all! This 2 bedroom, 1 bath lakefront home sits to the west of Raper Hollow with unmatched views of sunsets and the main lake with the added bonus of a dock, slip and the peaceful tranquility of lakefront living. Relax on the deck with a book and morning coffee or grab a pole and go to your own private dock. The location has direct access for all of your boating needs including tubing, skiing, wakeboarding, jet-skiing, or just anchoring down. Bring your boat and use our slip. Other water-craft can tie up to our dock. 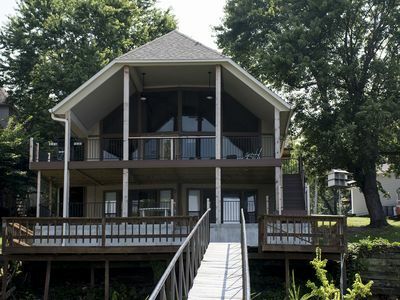 The back of the home faces the lake and the deck is completely shaded and includes a propane gas grill, and an outdoor fridge for your convenience. The main room offers 180 degree views of the lake and includes dining table, living area with a sleeper couch (queen), two lounge chairs and large screen TV viewing. The kitchen area offers bar seating for 4, dishwasher, microwave and full size fridge. Their is also a twin sleeper love seat off the entrance. Enjoy beautiful lake views from each of these areas. Both bedrooms offer lake views and include TV's and DVD players. The first bedroom has a queen size bed and the second bedroom has a 'single over full' bunk bed. Both rooms closets. The bathroom is a full bathroom with shower. One blow-up queen mattress is also available. * *For larger groups needing more sleeping areas please check on the availability of our 'Bunkhouse' property (Property listing #1334602) which sits directly above the 'Sunset Cottage'. It sleeps 6 additional people easily. You’re more than welcome to access the numerous board games, poker chips, telescope, etc…while enjoying a quiet evening inside. A washer and dryer are also available for your convenience. 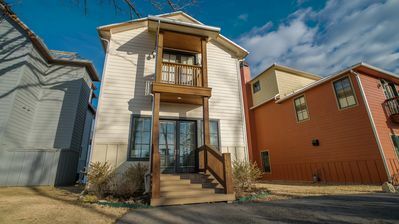 It is conveniently located an hour from Tulsa or Joplin, 15 minutes from Disney and Langley, and 40 minutes from Grove. Enjoy antique shopping, excellent eating, and multiple festivals throughout the year in all of these areas (watching the July 4th fireworks or Christmas Boat Parade from the deck or dock is something everyone needs to experience)! Welcome to Mi Casa Blanca Properties! The Rates are not on Display as VRBO has decided to make it difficult and you have to enter dates to get the rates. Use the Feedback tab at lower edge of browser window to let them know this is not good. Due to VRBO's lack of displaying info in regards to costs. One needs to be sure and put the correct number of Adults and number of Kids. There is usually a $15 additional charge per person per night over 4-6 people. However this does fluctuate. The deposit may go up as well. The VRBO calculations are correct, but they NEVER display the cost for extra persons. The cabin delivers the true cabin feel with the entire interior finished in Pine. With all the windows make sure the outside is brought in, to complete that at the lake feel. The 3 bedrooms and additional beds offers enough sleep space for most groups. 2 full custom shower bathrooms, one on each level. The tankless hot water system means there is never any fear of running out of hot water. The kitchen has nice appointments, with a dishwasher than can barely be heard. As you can see the island is huge and will offer most all a place in the group. The entertainment cabinet has a wine and beer refrigerator, and full stereo system with DVD player. A 55 inch TV is in the main room, with more to be added later. Outside on the lower patio is the 4-5 person hot tub. On the upper deck is the seating and propane grill with perimeter lighting. The swim dock is right out front in a small cove, and the main channel is right out the cove. With large groups, parking can be a problem, but not at this one. Right now, I have not gone thru all the details. They are not all going to be correct. VRBO has changed there methods to gain more control of the process and not just provide a organized listing location on the internet. It is going to take me quite q while with my get thur the entire setup. This completely remodeled grand home on Grand Lake will make a fine vacation place for your large family or group! It is a two-level home that is level on the front side with a walkout lower level that gently slopes to the lake on the back. It has 6 bedrooms-- including a master and two bedrooms on each level-- and 4.5 baths, two well-appointed kitchens, two living areas with queen sofa beds and woodburning heatilator fireplaces, two laundry rooms, a secluded screen porch, huge deck and extra large concrete patio with gas/charcoal grill, plus its own private dock. The driveway is over 100 ft. long and there is plenty of parking for your group's vehicles. When you are at the house, the lake is your playground and the home is comfortable and relaxing. You feel like you have escaped the hustle and bustle of daily life, yet you are only a few minutes from a marina and boat launch, groceries, convenience stores, bait shop, fishing licenses, gas stations, restaurants, boat rental facility, shopping, and many recreational opportunities. It is truly the best location on Grand Lake! Each living area boasts a 55" Ultra HD television with high-quality surround sound system, DirecTV satellite service and high-speed wireless internet. Big family dinners are easily accommodated as our dining table and deck table each seat 12 comfortably, plus the screen porch and patio each have a table for 4. The dining table in the lower level seats 6 and doubles as a poker, blackjack, craps and roulette table! The whole house has been recently remodeled, including all 4.5 bathrooms. The main level master bath has a sleek rectangular sink for two and features a pedestal tub and separate modern shower. For persons with physical disabilities, there are three short steps to the front door but once inside the main level is wheelchair accessible throughout. 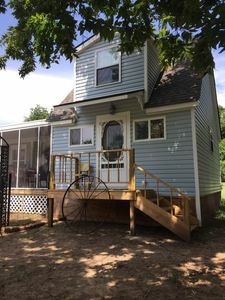 There is a gently-sloped sidewalk that goes around the side of the house to allow persons with disabilities easy access to the lower level and dock. PLEASE NOTE: We encourage our renters to pay by e-check instead of credit cards to avoid credit card processing fees. Reservations charged to credit cards will result in withholding 3% of the damage/security deposit for credit card processing fees. 4 Waterfront decks on 60' bluff make the views from this house spectacular. Huge Bedrooms & Bathrooms grace this home in beautiful gated community. 4+ bedrooms, sleeps 20. We have additional properties with gated community for larger groups. See VRBO #682476 and #676107. Overview Lighthouse Resort at Grand Lake offers a unique vacation experience. Here’s why…… A ‘resort within a resort’, the luxury home offered for limited rental is located within the recently opened South Shore at Grand, an exclusive gated community on South Grand lake. With swimming pool, clubhouse, private docks with walkway and tram access, and stocked fishing ponds, this lake side community is unique not only to Grand Lake, but to the central US. The constantly flowing interior water features flow over 5 waterfalls and through the meandering rock lined streams before running under the stone arched bridge and cascading into the lake. Our streams provide great wading and fun for small children (and grown ones!). The lighthouse, located out the front door and suspended on the lake shore, has an observation tower that towers 100 feet above Grand Lake. This provides a stunning vista of the southernmost 10 miles of the lake and the Pensacola dam. This provides a great place for a romantic glass of wine, a full moon, or a sunrise with a cup of coffee! 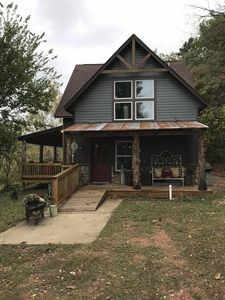 This community is located at the very south end of Grand Lake, Oklahoma, and is less than 1/2 mile from local dining, grocery store, and other services. This luxury home has the most up to date appointments offered anywhere, and the decorator selected appointments rival most 4 or 5 star hotels. Completed in January 2015, these accommodations are for those discriminating guests that want the best that Grand Lake has to offer. Our five decks on all three stories provide LAKE VIEWS as well as VIEWS OF OUR WATER FALLS…the fire pit and rock lined constantly flowing stream are located 10 feet out the back door, and the imported teak patio furniture on your private deck and at the pool are incredibly comfortable as you enjoy our views and the cool breeze that comes from the open lake vista located 60 feet above Grand Lake! 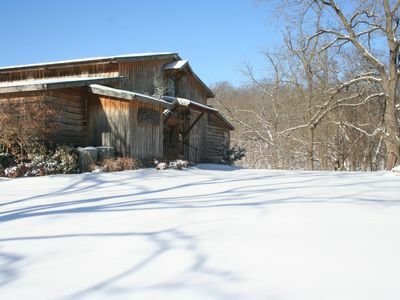 The Entire House (5 bedrooms/sleeps 20, 4.5 baths, large living area, fireplace, large kitchen, laundry, Smart TV’s, outdoor kitchen, fire pit, 5 decks with Lake View and Water Features (dams, ponds, streams) 2 Night Min Sunday-Wednesday with additional $350 cleaning fee 3 Night Min Thursday-Saturday (2 nights may be available with cleaning fee in off season-owners discretion) Does not include Tax 4 PM Check in 11 AM Check out Some flexibility if doesn't affect another guest No smoking in buildings and no pets allowed. If these rules are broken, all deposits will be forfeited and responsible parties will be asked to leave. All deposits are non-refundable (except for the damage deposit). After a deposit is made, if there is a cancellation, the deposit is non-refundable, or may become a credit that can be used for a future booking (discretionary). HOT TUB, coming Spring 2019. Large room for family time in peaceful community. The “Reunion House” has a Master Suite with a King bed and twin trundle, a second bedroom with a Queen and Twin Bunk Beds, third bedroom with King Bed with entrance into shared hall bath, a fourth bedroom with a Queen Bed. With the exception of the upper bunk bed and trundle, all of our beds are organic super plush pillow tops. Reunion house is located in a lakeside gated community. Swimming pool, boat dock with pontoon boat rental available, fishing, etc will give your family and friends plenty to keep them entertained. Large hot tub coming Spring of 2019. Situated in South Shore at Grand a gated community on the bluff of Grand Lake near Pensacola Dam, this home has spectacular views. But don't worry, lake access to boat docks is available by either walking or riding the motorized tram down to the lower level ramps. 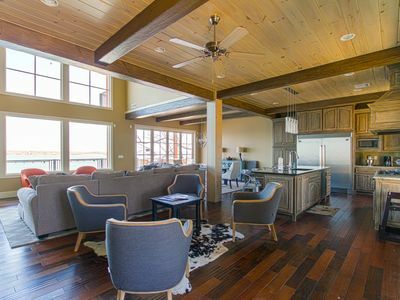 The Wake Home has five individual suites with a large open kitchen and living area on the top floor and a recreation room and wet bar on the lower level leading out to a large patio with a fire pit. The upper floor has a landing between the two suites with two sleeper sofas. The community boasts a swimming pool with heated/air conditioned viewing room and streams and interior ponds which the younger folk love to fish in. This is a family oriented community with peaceful views. Winter is a great time to experience the community to enjoy the outdoor fire pit and/or fireplaces located on the main and lower levels of the Wake. This beautiful home and community will exceed your expectations. There is just no way to adequately describe the setting of this brand new house. The sound of the waterfall serenading you on the decks on one side are a bonus to the lake view off the back patio and deck. Perfect for family gatherings, this home has multiple sleeping areas including a crow's nest with ladder access which older kids will love. Waterfall Serenade is located in a gated lakefront community. The community boasts a swimming pool with heated/air conditioned viewing room and streams and interior ponds which the younger folk love to fish in. This is a family oriented community with peaceful views. Winter is also a great time to experience the community to enjoy the outdoor fire pit and/or fireplaces located on the main and lower levels of the Serenade. This beautiful home and community will exceed your expectations. This luxury home has a designer look and feel that rivals most 5 star hotels. Completed in January 2016, these accommodations are for those discriminating guests that want the best that Grand Lake has to offer. 2 bedrooms and large loft sleeps up to 8. 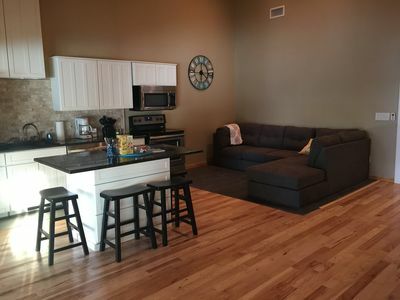 2 baths, large living area, open kitchen, laundry, Wi-Fi and Smart TV’s. South Shore at Grand Lake offers a unique vacation experience. A ‘resort within a resort’, the newly constructed Weekender is offered for limited rental located within an exclusive gated community on South Grand Lake. With swimming pool, clubhouse, boat rentals at private dock with walkway and tram access, and stocked fishing ponds, this lake side community is unique not only to Grand Lake, but to the central US. The constantly flowing interior water features flow over 5 waterfalls and through the meandering rock lined streams before running under the stone arched bridge and cascading into the lake. 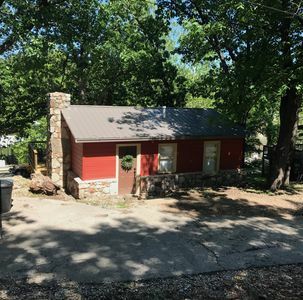 This community is located at the very south end of Grand Lake, Oklahoma, and is less than 1/2 mile from local dining, grocery store, and other services. The lighthouse, located on the waterfront and suspended on the lake shore, has an observation tower that towers 100 feet above Grand Lake. This provides a stunning vista of the southernmost 10 miles of the lake and the Pensacola dam. This provides a great place for a romantic glass of wine, a full moon, or a sunrise with a cup of coffee! Located on the southern shores of Grand Lake O' the Cherokees, it is a magnificent secluded waterfront resort. A visit to Dream Catcher Point offers a stunning setting that you will always remember, with over 20,000 flowers in bloom from April to November, Dream Catcher Point Resort is rich and alive in a sea of color. As you walk the gentle slope of the grounds beneath the splendor of majestic trees, you will be surrounded by the soothing and relaxing sounds of 9 cascading water features, Highlighted by two 100 foot waterfalls that leads you to a magnificent panoramic view of the lake maybe just in time to see Grand Lake's spectacular orange and red sunsets! Dream Catcher Point Resort is the perfect location for family getaways, retreats, weddings, Receptions and family reunions; Dream Catcher Point is known as a family oriented resort! Book us today! 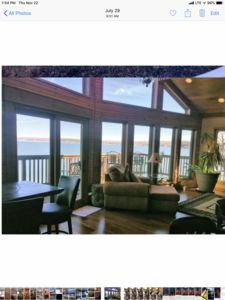 The Entire resort including: 12 Bedrooms, 5 Living Areas, 7.5 baths, beautiful main lake view decks, laundry area, kitchens, Indoor Fishing dock and much more $2,500 per night. 2 Night Min Sunday-Wednesday 3 Night Min Thursday-Saturday Does Not include Tax 3 PM Check in 11 AM Checkout No smoking in buildings and no pets allowed. If these rules are broken, all deposits will be forfeited and responsible parties could be asked to leave. All deposits are non refundable (except for the damage deposit). After a deposit is made, if there is a cancellation, the deposit will become a credit that can be used for a future booking. Right on the Water, Best View On The Lake! One of the best lots on Grande Lake. Views can't be beat. 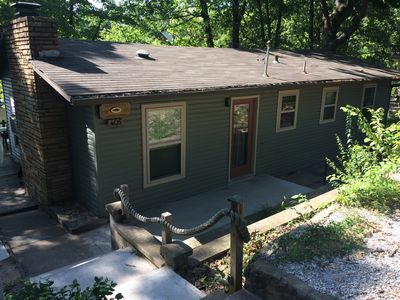 Create great memories enjoying this 3 bedroom, 1.5 bath house on the main lake. Enjoy the outdoors on our 2,000 square foot deck. 10 steps down from the deck and you are on the catwalk that leads to the swim dock. The master bedroom has a king sized bed, the middle bedroom has a double bed and the front bedroom has a queen sized bed. Spacious family room with huge fireplace. Enjoy indoor dining with a large table that seats 8 or enjoy outdoor dining with multiple seating areas. Has Wi-Fi and Cable. Get ready for one of the best times of your life! 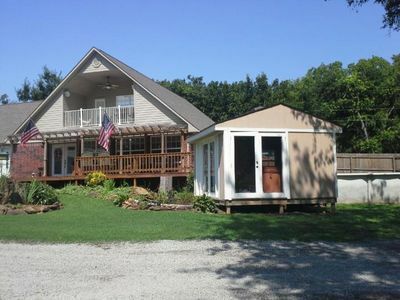 Enjoy this 2 bedroom 2 1/2 bath Lake House that comes with extra sleeping space in the downstairs area. Upstairs has 1 Queen bed and 1 Full size bed. Downstairs has 1 Queen size bed, 1 Full size, 1 Twin size and a Futon. This Lake House can sleep a total of up to 11 people. 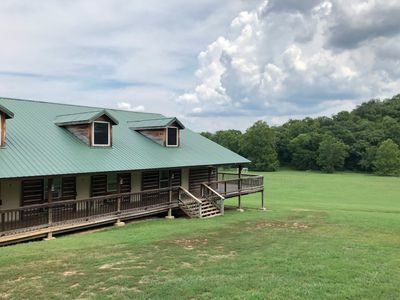 The property also comes with a boat house with an indoor fishing hole for the fishing enthusiasts, TV, heater, air conditioning and some kitchen ammenities. Sunrise Cottage sits along the Langley bluff with a fabulous view of the dam from Langley to Disney. It boasts a 180° view all the way up the lake toward Duck Creek. 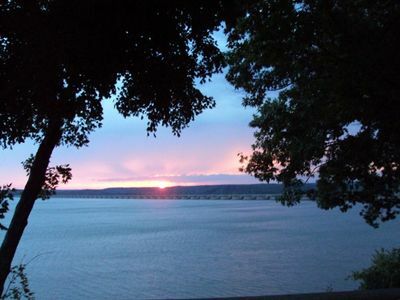 This place has the ultimate million-dollar view, with the best sunrise views on Grand Lake. Sit on the deck or in the Hot Tub and enjoy. 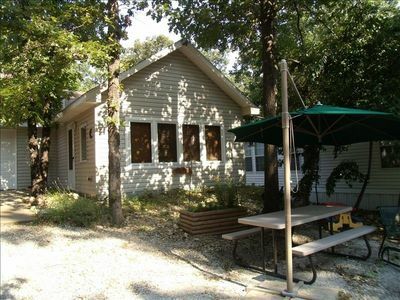 Sunrise Cottage is a 2 minute drive to Reasors, shopping and dining, yet private enough to be in a quiet neighborhood. It has ample outdoor deck seating with courtyard that is well shaded with large beautiful trees, as well as a screened in porch area complete with dining table and ceiling fan. 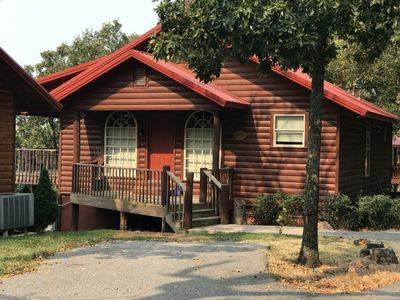 With over 100 feet of lakefront, views from almost every room, Sunrise Cottage will give you the peace and quiet you desire or put you in the middle of all of the South Grand Lake action. 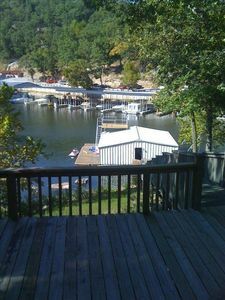 With your own private covered dock you will have access to all lake activities. 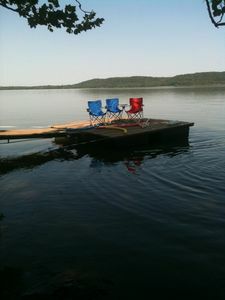 The water is deep, the fishing is good and has a protected area between the dock and the shoreline to let the kids swim. While there are steps down to the dock, they are for the most part gradual and not extremely difficult to navigate. The home itself has an open concept in the kitchen, living and dining areas so the cooks don't feel left out. A relatively large area, it is able to accommodate many people with two sofas, two club chairs and ottoman and a 55 inch smart TV . Sunrise Cottage has 4 bedrooms, and 3 bathrooms. The large master bedroom has killer views of the lake, king sized bed and it’s own private bathroom with double sink vanity and large shower. Two of the bedrooms at the other end of the house boast comfortable queen size beds and share a common bathroom that has a tub and shower combination. The 4th and smaller bedroom has bunk beds, full size on bottom and twin on top. It also has it’s own private bathroom with shower. Deck space is to your own desire. There is a screened in porch, an open deck with hot tub with seating close enough for the parents to have a view of the lake all while keeping an eye on the younger people as they are enjoying the hot tub. There is also a courtyard with table and chairs and bench seating for a large group to sit and visit. Sun or ample shade, your choice. The dock is accessible by stairway that is not overly steep and easily navigated by anyone that is capable of navigating a flight of stairs. 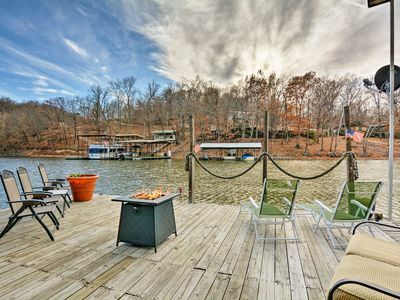 Waterfront beauty with dock and fireplace! Check in Bay! Sleeps up to 10! The definition of La Dolce Vita is the good life, full of pleasure and indulgence which is certainly true of this gem of a home. Gather around the farmhouse dining table, fireplace, enjoy the beautiful waterfront view and make memories sure to last a lifetime! It has 3 bedrooms, 2 queen beds and one bedroom with twin beds. There is also a day bed in living area with a twin mattress to sleep, curl up with a book or just enjoy the spectacular view. An inflatable queen mattress to accommodate 2 more guests is available. Will sleep up to 10. Enjoy early morning coffee, grilling or just relaxing on this beautiful deck will be sure to make for a great time with family and friends. There is a boat slip for guests use in this beautiful cove. along with paddle boards provided for guests use. The kitchen is fully stocked with utensils, appliances and extras to make the chef in your family happy. It also has marble counter tops, farmhouse sink with dishwasher, gas stove and refrigerator. Washer and dryer are located behind barn doors off the kitchen. It is great for fishing, swimming, boating or just floating in the calm water with a cold beverage. This home has just recently been totally gutted and rebuilt fresh to make for the best use of space. You instantly relax as soon as you walk in and take in the plush, relaxing interior. This home will sure to become a favorite of many families who visit. 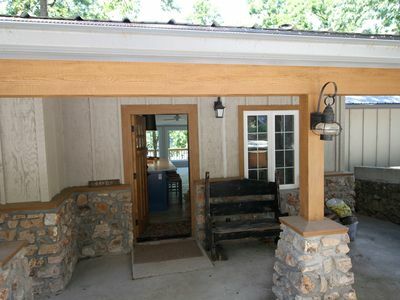 Welcome to Dripping Springs cove on Grand lake! Just bring your swimsuit and beach towel and you are guaranteed a Grand time…. Large, updated open home on the South end of Grand Lake is the perfect place for family reunions or a relaxing getaway. 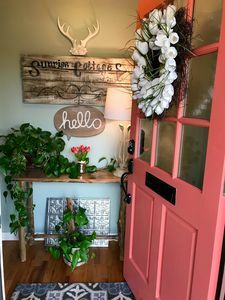 The pet and smoke free house is spacious and a fully stocked kitchen is furnished with stove/oven, refrigerator, microwave, small appliances, dishware, and cooking utensils. Linens are provided for the three bedrooms (plus two extra beds) and two full baths. The master bedroom has a king bed, the second bedroom contains a double bed, and the third bedroom contains a double bed and bunk beds. Flat screen TV with satellite and DVD located in main living room. Washer and dryer are included and some board games are provided. A large deck overlooking the cove has a partial awning for shade and includes a BBQ grill with tables and plenty of seating/dining space for everyone to relax. There is also a fire pit and benches on the easy walk down to the dock for cool evenings and smores!! 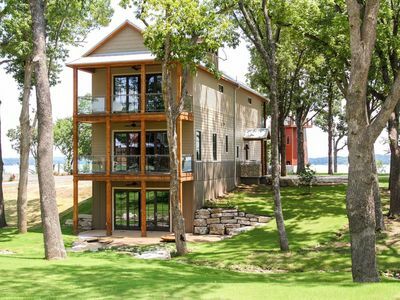 The short walk down to the lake will lead to a private one slip covered dock that includes a swim deck with a great view of The Cliff in Dripping Springs! Paddle over and JUMP!! Paddle boat included. A marina with 24/7 gas is available across the cove. Dripping Springs is located approximately five miles from the Pensacola Dam and there is great fishing, sight seeing and a golf course in town. Enjoy!!! Enjoy a relaxing stay in this vintage lake retreat with a modern flair. 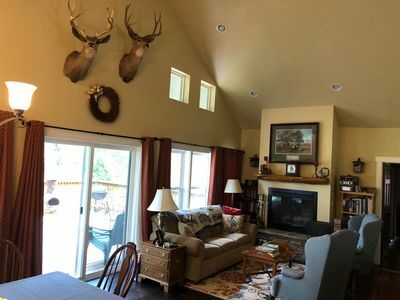 Newly remodeled, this cabin is comfortable, light and airy with vaulted, cedar beam ceilings with sky lights and offers a large deck overlooking the lake where you can enjoy your breakfast or grill out, if you like. Imagine waking up to the sound of birds chirping and looking out to see the lake right there, teaming with wildlife. Leave the hustle and bustle of the city behind! The cabin offers four comfortable queen sized beds. 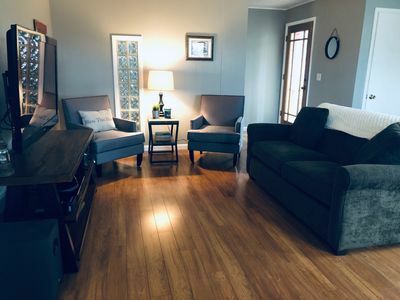 One is located in the lakeside bedroom, this room is outfitted with the comfortable bed, a dresser, a TV with DVD player, hooks, hangers and a lovely view of the lake. The bunk room is outfitted with "grown-up" bunkbeds, featuring queen sized beds, individual reading lamps with electrical outlets. The room offers a dresser and hangers for your convenience. There is a comfortable queen sized Intex auto bed located in the guest closet and a single sized futon in the dining room. 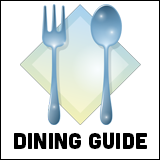 The dining room offers a large table with eight chairs. Perfect place to enjoy meals, morning coffee or enjoy some games. The large living room features a cozy sectional sofa, a TV and a blue ray player. The home features almost anything you need to cook a meal in the open, well equipped kitchen. Included is a Keurig and a 12 cup coffee maker, a toaster, a blender, and plenty of pots and pans, etc. There is a charcoal grill outside, along with a fire pit for your evenings around the campfire. 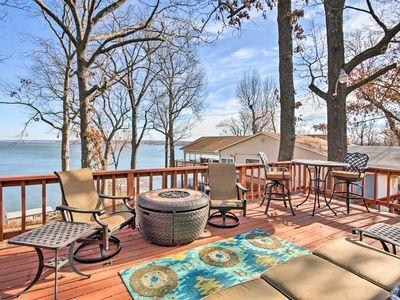 Surrounded by nature’s glory, it is nestled toward the back of Fox Hollow cove on South Grand Lake, an easy 1:20 commute from Tulsa. This lake offers so many things to do, check out these web sites for events, dates, locations, reviews, and more! 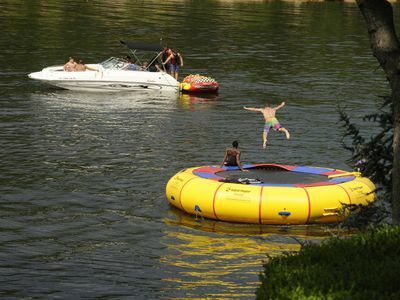 While you’re here, you can enjoy a swim or some kayaking in the calm cove or jump off the upper deck of the Wahoo dock. It is a short, easy walk to the water. Bring your boat or your watercraft and park it in the courtesy slips offered with this home. The fishing in this cove is fantastic! Fox Hollow Cove is located just off of Drowning Creek and a 20 minute boat ride to Dripping Springs Cove and many other hot spots. Guests have access to one covered boat slip and one watercraft slip. You also have the use of two small kayaks. The home offers a large variety of movies and games for those quiet evenings after a long day on the lake.